Any debate regarding the case for the field marshal promotion needs to focus on Monash’s worthiness and not clouded by issues that may or may not be relevant to other cases that need to be considered as separate entities. The pre-eminence of Sir John as Australia’s foremost soldier is unquestionable and is often cited as the most able General in the WW1. With his holistic approach, his record of field command achievements betters that of both Birdwood and Blamey. As Field Commander of the Australian Army Corps in 1918, Lieutenant-General Monash had five Divisions directly under his command (approx. 166,000 Australians) making it the largest of all Corps. This was added to by American, Canadian and English Divisions making up the equivalent of over eight Divisions and 208,000 personnel; the equivalent of and sometimes in excess of a designated Army. Whilst there is a fairly rigid criteria for awarding the field marshal rank in time of war, there are many examples of the rank being conferred for either ceremonial purposes ( King George VI, the Duke of Edinburgh for example) or rewards for outstanding service which may not follow the strict criteria used in wartime (both Lord Birdwood in 1925, and Sir Thomas Blamey in 1950 are both symbolic rewards for service). Immediately after WW1 the field marshal rank was conferred on Herbert Plumer, Ferdinand Foch (French), Edmund Allenby, Sir Henry Wilson, Sir William Robertson and Sir Arthur Barrett. All were rewards for service, that is, symbolic. Precedent (Birdwood) suggests that a full General rank was warranted either during 1918 or immediately after the War upon recommendation of the Prime Minister, Billy Hughes. However Hughes refused to do this and withheld any recognition for Monash post WW1. Full general rank was bestowed only in 1929 by Labor Prime Minister Scullin. This injustice is a core point in the case for the promotion as it was the actions of Prime Minister Hughes that prevented the most warranted recognition being given to Monash whilst he was alive. Since 1954, the Australian Prime Minister, acting in that capacity, can award field marshal rank. It does not require parliamentary support though, of course, this is desirable. Nor does it require a precedent, though this is often assumed and argued. Until Monash is given the symbolic rank of field marshal, similar to Birdwood and Blamey, he is automatically seen historically as a second rank General that is clearly not indicative of his impact and skill as a military leader who played a major role in shaping history. Since 1929 the promotion in rank would be one step not two as Minister Tehan has stated. This issue of posthumous promotion is sometimes put forward as a reason for not bestowing the promotion as it is seen as setting a precedent. In fact, as stated in point 5, the Prime Minister does not need a precedent, it is within his/ her power to set a precedent. Quite apart from this there is a precedent in Australia (and the U.S. with George Washington). On the 27 April 1915, Colonel Henry Normand MacLaurin was killed at Gallipoli shortly after landing. He was commander of the 1st Brigade of 1st Division. On 9 July 1915, with the presumed knowledge that Colonel MacLaurin had died two and a half months earlier, he was gazetted as being given Temporary Brigadier General rank backdated to 15 August 1914 (as were McCay and Sinclair-MacLagan) and effective when in command of a Brigade which MacLaurin was at Gallipoli. To argue that this rank was not effective is untrue and also reflects an unpalatable fact that had MacLaurin not died in the service of his country as McCay, Sinclair-MacLagan and Monash did not, he would be formally ranked as a Brigadier General but because he did die he should not. A very disrespectful and unfair outcome! Thus whilst the Prime Minister does not need a precedent there is one. Posthumous awards have often been given for Order of Australia recognition and military medals and decorations such as VC’s. The issue of not being on the Active list is also raised as an objection. However, Monash was restored to the Active List for the period between 1 January 1931 and 5 April 1931 so he could represent the Commonwealth at the inauguration of New Delhi. Thus the promotion to field marshal can be backdated to between these dates which is after he was made a full general in 1929. Backdating is not an issue- it is often done and Blamey’s field marshal rank was also backdated. Given the active campaign by the Saluting Monash Council, chaired by the Hon. Tim Fischer AC to have General Sir John Monash promoted to field marshal (probably the most active since the conclusion of WW1), failure to do so will relegate the Prime Minister to one of two Prime Ministers who deliberately rejected the promotion - the other being Billy Hughes. Not a good legacy. It is appropriate that the promotion be effective in the Centenary years of WW1 and this should happen before or at the opening of the Sir John Monash Centre in Villers- Bretonnuex in April 2018. The Saluting Monash Council’s objective is to achieve the posthumous promotion of General Sir John Monash GCMG KCB VD to the rank of Field Marshal by 11 November, 2018. General Monash is widely regarded as Australia’s pre-eminent soldier and citizen, and the most effective commander of the First World War. 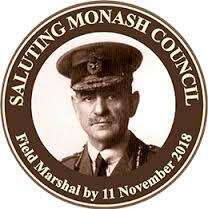 The Saluting Monash Council has been established to ensure that the immense contribution and legacy of General Monash is symbolically reflected through his elevation to sit alongside the four Australian Field Marshals appointed since Federation in 1901. At the Spirit of Australia Foundation’s June 2017 board meeting, the executive reiterated its wholehearted support for the initiative of the Saluting Monash Council to achieve the posthumous promotion of General Sir John Monash to Field Marshal by 11 November 2018 – the centenary of the Armistice that ended hostilities in the First World War.